My favorite room in the ranch…obviously, the dining room! 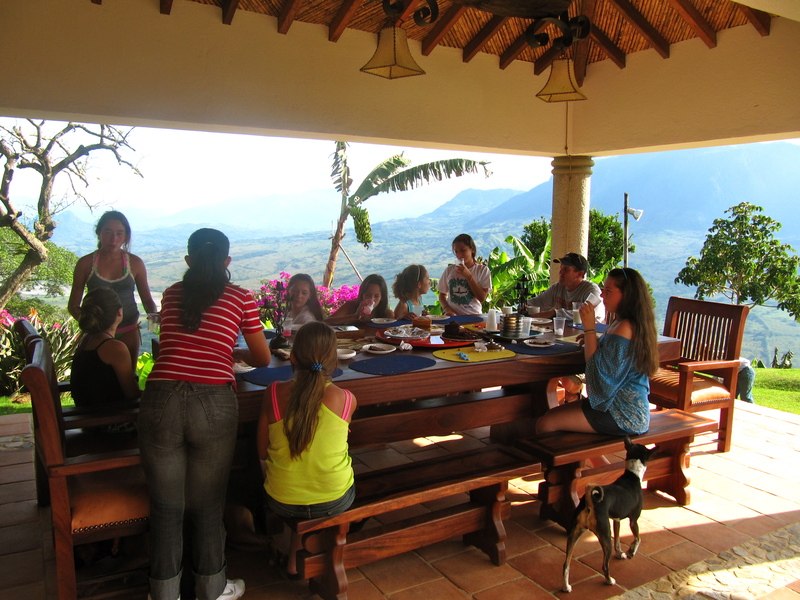 The more time I spend in Colombia, the more I fall in love with the country, the people, the food, and the way of life. Colombians don’t live to work, instead, they work to live. They do what they need to do to get by and then they enjoy life without excess. While driving through the mountain towns to get to the farm, I noticed that there was not one window or door of a house that did not have someone hanging out of it. There was not one street corner that did not have a group of kids standing around and chatting. There was not one front stoop or front yard that did not have an elderly woman cooking or selling something, at the very least. People socialize the old-school way in Colombia—in person. They aren’t chatting via their blackberrys, I-phones, facebooks, twitters, or any of the other million ways Americans have found to talk without being in each other’s physical company. Instead, they are gathering at cafes, neighbor’s houses, street corners, tiendas, and parks to enjoy the simple aspects of life that American’s so frequently overlook. 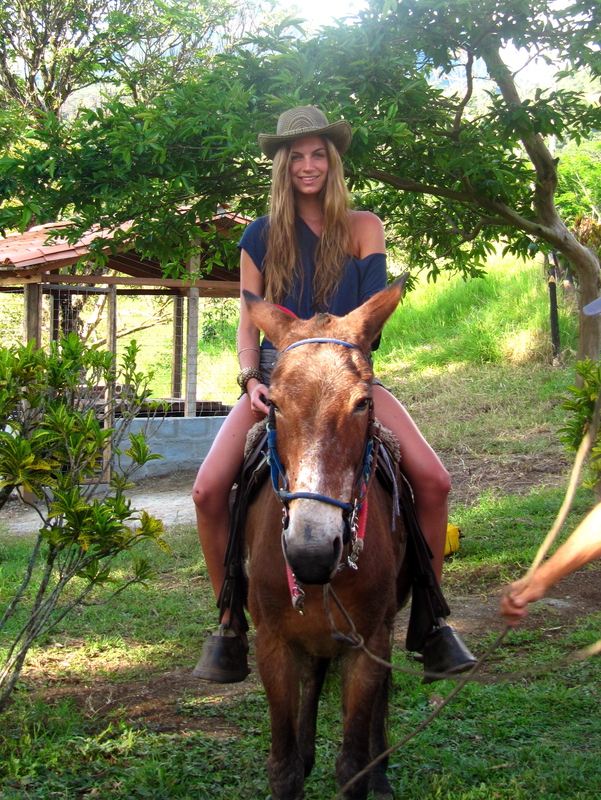 Me on a Mule…my new favorite mode of transportation! The man’s arm in the photo is Don Jairo, and he is as real a ranchero as they come. He did physical labor from sunrise to sunset…lassoing horses, bathing sheep, raking the yard, gathering plantains, catching fish, and fixing fences. By the end of the weekend, we collectively agreed that if Don Jairo was shot at, homeboy would catch the bullet between his teeth and continue right on with his work. He was also married to Marta (one of the women that prepared the food for us throughout the weekend). And I guess that now would be a good transition back to food, as I have gone off on quite a bit of a tangent! 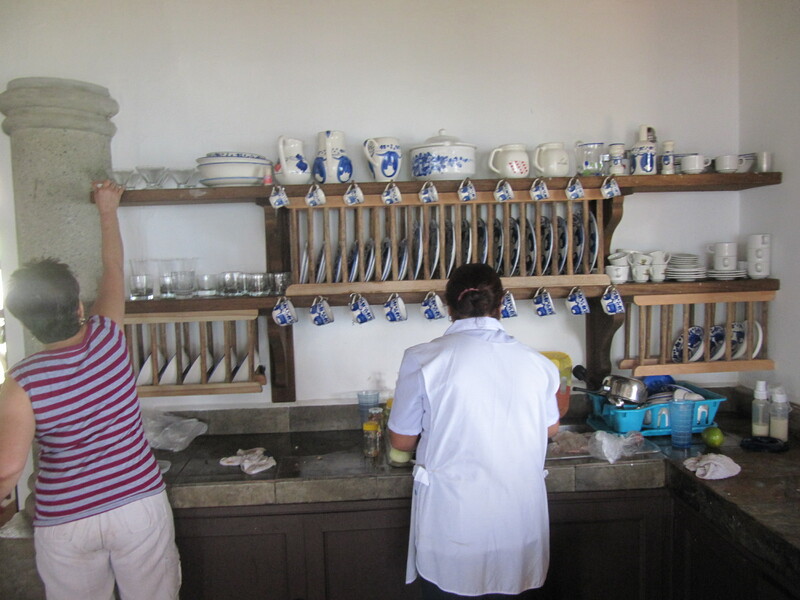 As I mentioned in my previous blog post, all of the food was prepared daily by Colombian natives, Marta y Maria. These two women spent the entire day in the kitchen. They would prep, cook, serve, and clean one meal and then begin the process all over again for the next meal. 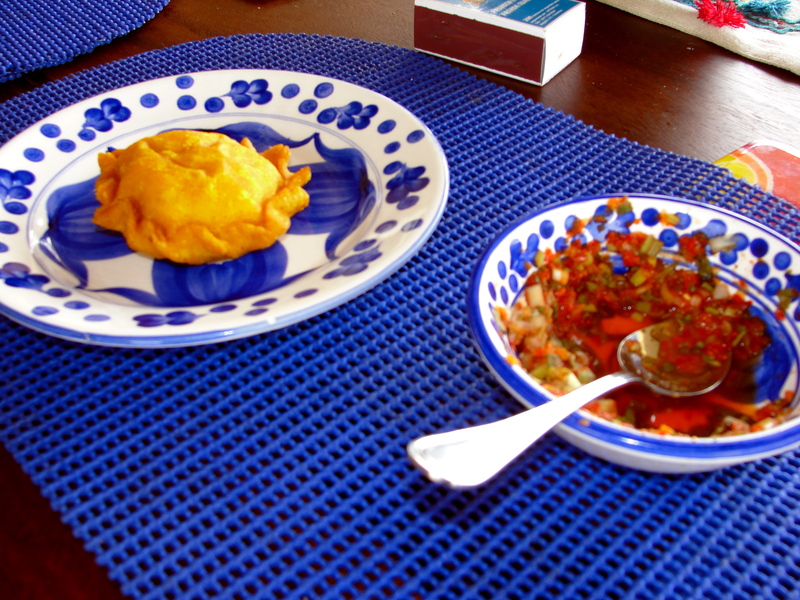 Today we got started with Pastellitos for breakfast, which is a soft corn-meal dough filled with shredded chicken, mashed yucca, and diced tomatoes. 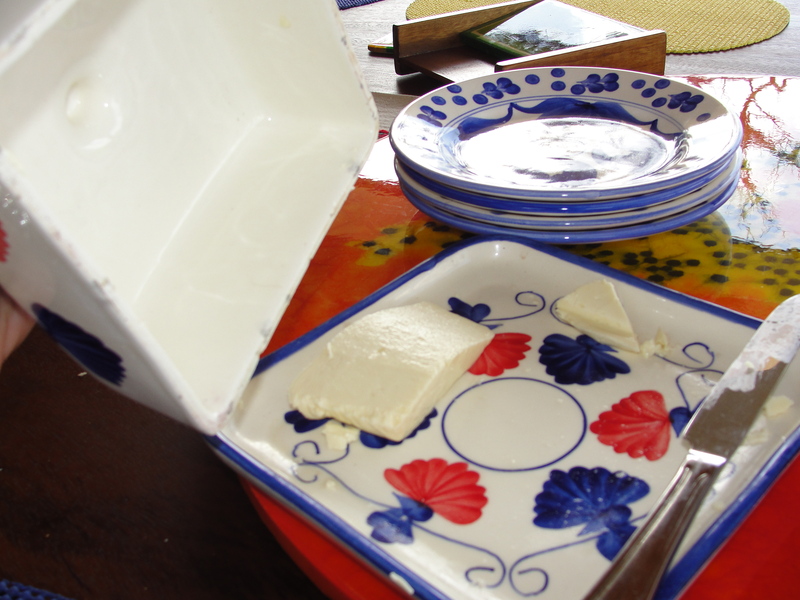 I also added some salsa picante to mine, which is shown on the plate and a little bit of queso blanco. They were so incredible. I am used to picking up pastellitos from the prepared food section of Sedanos (Latin-American supermarket chain in Miami), but they were nothing compared to these homemade delicacies. The dough was soft, despite being fried and the mashed yucca was a perfect complimentary texture to the shredded chicken. My favorite part about breakfast though was the assortment of drinks! I kept switching between gulps of coffee, freshly squeezed orange juice (out of this world), and Colombian drinking chocolate, which is my new obsession. The drinking chocolate is served hot like American hot cocoa, but it is water based and much sweeter than regular hot chocolate. I have already purchased a huge bag for my apartment when I go home! 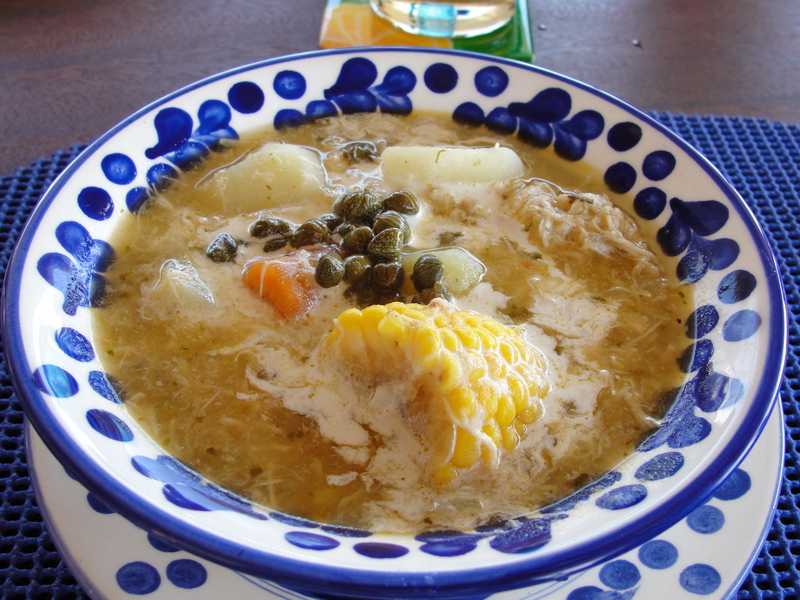 For lunch, we were served Ajiaco, which is a traditional Colombian potato soup from the Bogota region. 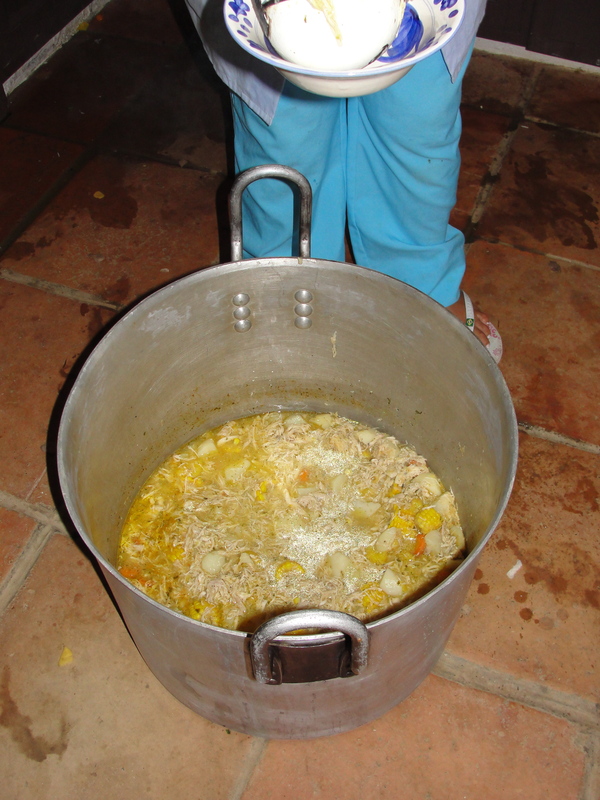 The soup is a chicken stock with pieces of shredded chicken, large chunks of corn on the cob, and two or three different types of potatoes. The broth gets its distinct flavor from the aromatic herb known as Guasca, which I have never tasted before, but fell in love with this afternoon. The soup is then topped off with some capers and heavy cream just before serving. This soup is just an explosion of flavors and textures in your mouth. The corn is sweet and the capers are salty, and the chicken is tender and pulled into perfect little pieces. I loved the addition of the heavy cream at the end, which pulled everything together and complimented the nutty flavor of the parmesan cheese, which I also put on my bowl. This soup was the definition of hearty comfort food. It puts American chicken noodle soup to shame. 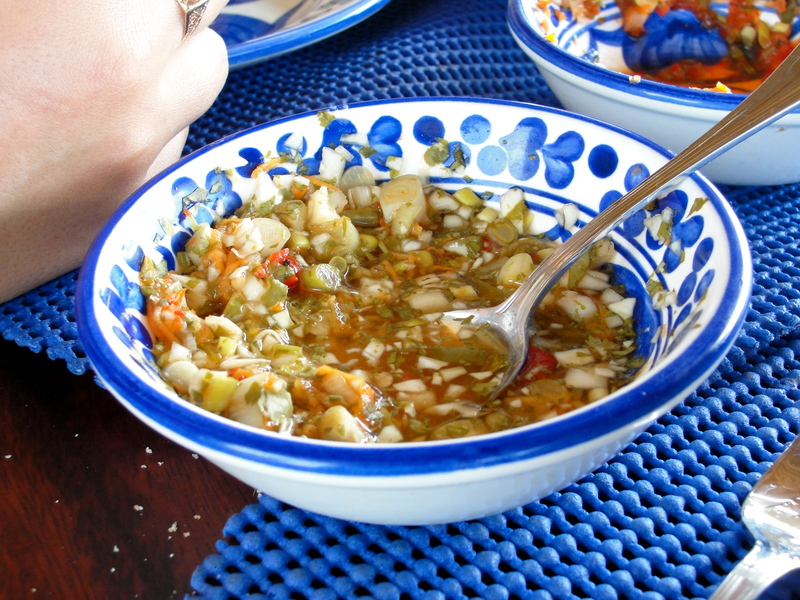 I had a generous two bowls, and Marta y Maria began to refer to me as the “chica dos porcion” (two-serving girl)!! When they would come to the table to pick up everyone else’s dishes at the end of the meal, they would bring out an extra serving for me instead! For dinner, we ate light and fresh. We had Grilled Churrasco, which is thinly sliced steak and Salchichas, which are small sausages. The Salchichas were served on skewers and dipped into spicy mayo sauce, which was delicious and homemade, of course. 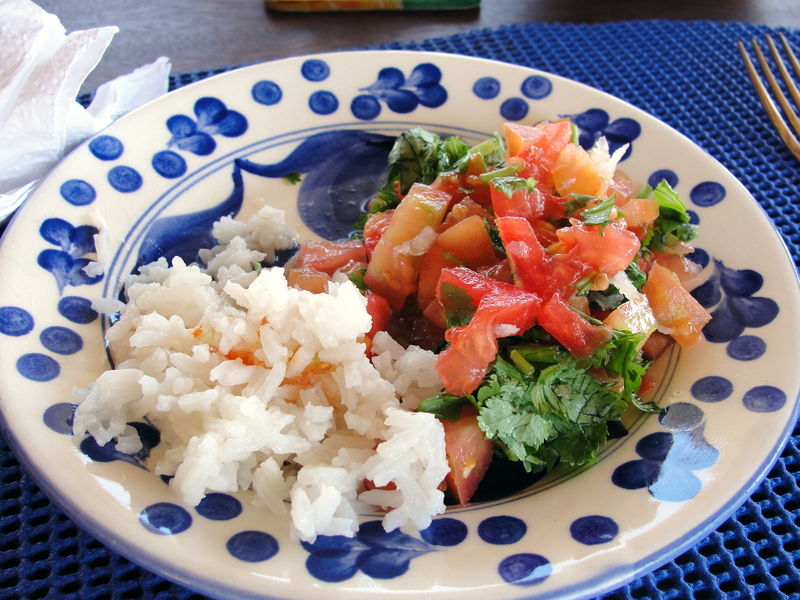 We then had Spanish Rice topped with Fresh Pico de Gallo, which is similar to a chunky salsa consisting of; diced tomatoes, Spanish onion, cilantro, garlic, lime juice, and salt. 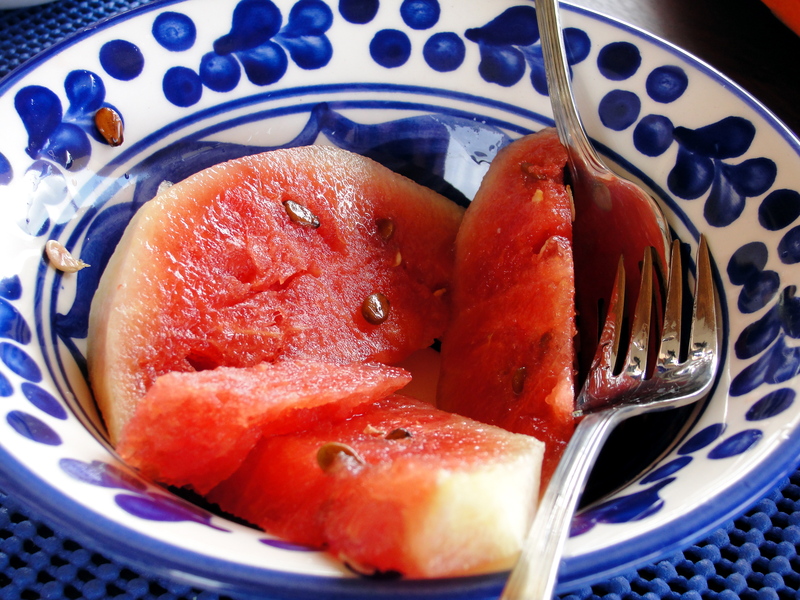 It seems really simple but the flavors are so extreme and it tastes much more complex than a few basic ingredients. I mixed my rice and Pico de Gallo together and it tasted like Chipotle, except a million times better!